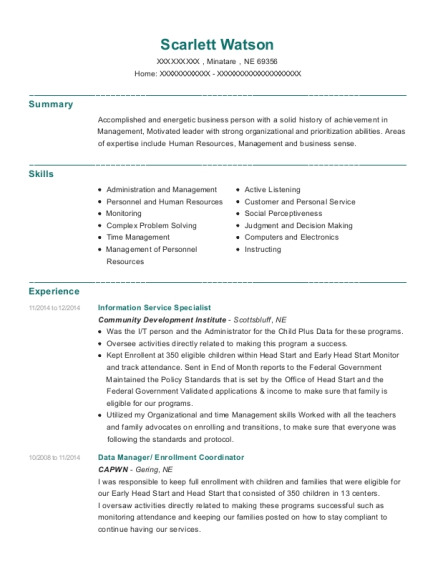 Reliable data specialist working on a Business Management degree and a broad background in the education field. Responsible and with a high sense of teamwork. Clerical experience and intermediate computer knowledge. Able to follow policies, regulations, and procedures. Effective procedures of office management. Maintain a variety of logs, files, and records. Request and input data in the NGS & FileMaker Pro system to ensure accuracy and time lines. Log all incoming records and data entered, and maintain an organized filing system. Generate reports for evaluation and management purposes. Provide technical assistance as requested. Maintain a high level of confidentiality due to the sensitivity of information managed. Assist the administrator in the coordination of events. Identify and recruit families for the Migrant Education Program. Provide program services to the qualifying families and maintain continuous communication with them. Maintain highly effective communication skills with costumers and coworkers. Assist in program events and flexible to changes in work schedule. Identify and recruit eligible families for the Migrant Education Program. Enter all required data in the NGS & FileMaker Pro system before reaching time lines. Maintain reports and organize files. Conduct a needs assessment for the families and assist them with the resources available. Plan and organize required events and activities; to include location, presenters, meals, and transportation. Submit purchase orders to request office supplies, as well as events and travel expenses. Responsible of the well being of students and parents in educational trips and maintain a professional relation with them. 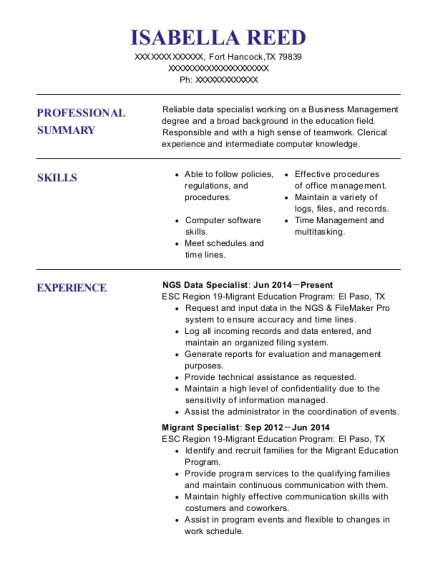 This is a resume for a NGS Data Specialist in Fort Hancock, Texas with experience working for such companies as ESC Region 19 Migrant Education Program and ESC Region 19 Migrant Education Program. 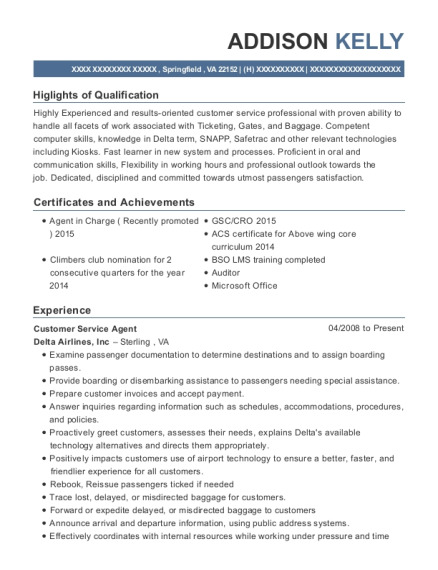 The grade for this resume is 0 and is one of hundreds of NGS Data Specialist resumes available on our site for free. 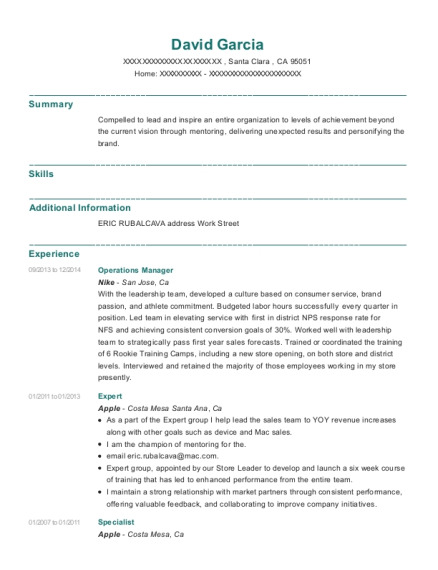 Use these resumes as templates to get help creating the best NGS Data Specialist resume.